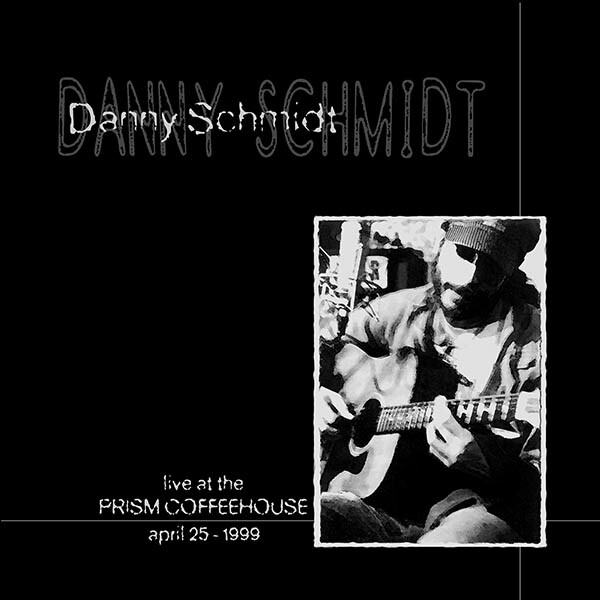 Danny's debut album was a one-night show recorded live at The Prism Coffeehouse in Charlottesville, VA -- and is aptly entitled Live at the Prism Coffeehouse - April 25, 1999. More thought went into this seemingly thoughtless title than you can possibly imagine. The production of the recording was focused on capturing the immediacy of the performance in this small and intimate venue. This sort of production sensibility suits Danny's music well, as his songs have a lyrical subtlety and emotional expressiveness that would get lost in a high-gloss studio production.This recording captures the scratch of the strings and the drawn breaths between lines -- the things that make a live performance so accessible and engaging, from ten feet away. While usually a solo performer, Danny was joined on various songs by several standout musicians in the Charlottesville area: Joia Wood on harmony vocals, Stuart Whitford on mandolin, Tim Freilich on harmonica, Rolland Colella on fiddle, Paddy League on bodhran (drum), and Kirsten Thorsen on harmony vocals -- each adding wonderfully tasteful nuances and textures. The album, first and foremost, features Danny's songwriting, in songs ranging in context from The Donut Song's unconditional love to McCreary's Pipes very conditional love, from Belief's incessant yearning to Lucky's grateful acceptance, and from Heaven's affirmation of life to Last Night's quiet suicide. The songs selected for this album were chosen to represent the often contradictory feelings and truths that we all have to do battle with, and somehow reconcile, to live sanely. That's why a body of work (an album) is so much more valuable than a particular piece of work (an individual song), because two songs back-to-back can each say the exact opposite thing, both be equally sincere, and together create a deeper, rounder, more complete snapshot of the human experience. The hope of this album is that the listener can connect to the stories and images and feelings in a way that feels familiar to real life.